November 2014 – Finding a new "normal"
I recognize that it could be viewed as a form of laziness, reposting a portion of last year’s Thanksgiving-themed blog. (Particularly since I’ve been a real slacker in my blog writing for the last half-year.) Indulge me, if you will, in allowing this one to be passed around in a few heads and hearts again. The message is no less important this year. For the record, I am exceedingly grateful this year for the joys and milestones experienced in my life and in the lives of my immediate family members. I am grateful for many sincere, genuinely loving and lasting relationships in my life. I have some really awesome friends … and I wish we could spend more quality time together. I am grateful to God for the grace (unmerited favor) that gives me an opportunity to share the gospel (good news) of Jesus with people I may never have a chance to interact with otherwise. May you all have an abundantly joyous Thanksgiving as you seek to truly GIVE thanks. Thanksgiving Day, when I was growing up, was one of the more revered holidays. It wasn’t a religious holiday, but it was a holy day in many ways. Businesses were closed. We set aside that one day to gather with family – as extended as possible – for an afternoon and evening of feasting. Often, the party moved from one house to the next where we had an opportunity to see new, happy family faces at each stop. When I think of family gatherings, inevitably, I remember the Thanksgiving Days of my earlier years. Now, Thanksgiving Day has been diminished to a sort of pre-game for the Superbowl of holiday shopping. 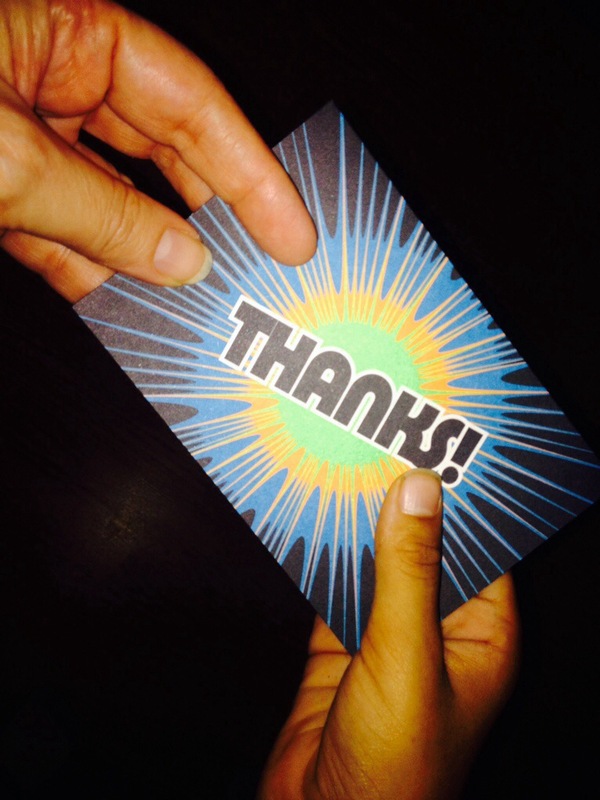 It’s appalling, really, our lack of attention to the importance of acknowledging and demonstrating gratitude. Surely, we could all use a day to lay aside our cash and credit cards to assemble with friends and family, and to simply be grateful – individually and collectively – for what we have received and for the grace we have witnessed in our lives. I’ve noticed a few of my Facebook friends starting a daily post of thanks-giving as the holiday approaches. Even though a few folks are posting their daily journal in a public forum, I hope there are several more who have, perhaps, decided to take on the Give Thanks challenge in a more private way. Will you be honoring Thanksgiving Day as a day to practice gratitude in your family? I hope you put as much (or more) effort into that plan as you put into planning which sales you might hit on Black Friday. I really like the phrase “give thanks.” I like it because it emphasizes the truth that gratitude isn’t something meant to be felt and left there. It’s meant to be shared, to be given away. Thank you for spending your time reading and thinking about gratitude with me. Now, let’s give thanks together – generously. Author ssalvinPosted on November 22, 2014 November 22, 2014 Categories UncategorizedLeave a comment on Give thanks, again. Starting anything new has inherent hazards. Starting a new ministry has the same hazards as starting other new ventures with the added weight of operating in the realm of faith-over-feelings. In listening to the stories that others have shared with me, both directly and indirectly, I have discerned that many of us hold a certain amount of hope after enduring painful or otherwise difficult life circumstances. For people of faith in Jesus, that hope is tied to a belief that “all things work together for good.” We take that to mean that great value and understanding can come from our experiences of suffering. Even more directly, we believe that we are transformed by the work of God the Spirit during these experiences of suffering. It is the process of transformation by the Spirit of God that brings us hope and that hope is the most important ingredient in the building of our faith. After having one pilot session in Raleigh, NC – Opening the Door to Hope: Spotlight on Addiction – we are now looking for churches to host several more pilot sessions. 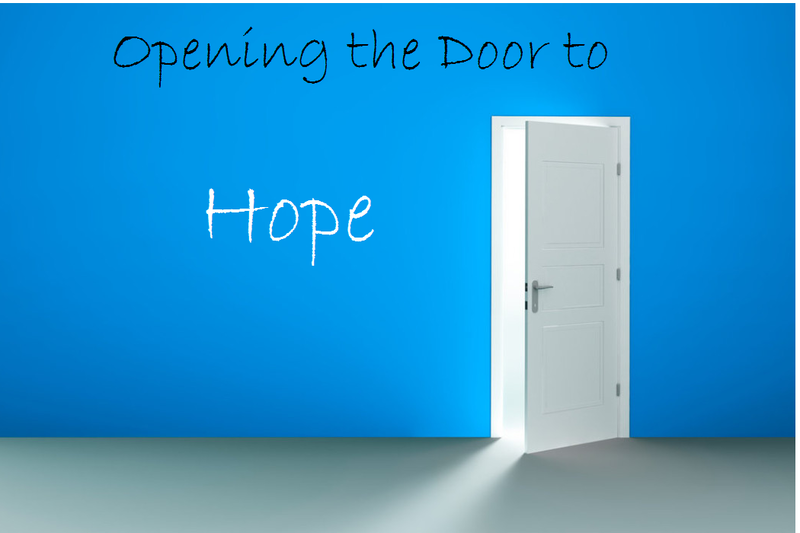 During these sessions, ministers, lay leaders, members and guests will gather to discuss the concept of developing Hope Ambassadors through the training ministry of Opening the Door to Hope. These Hope Ambassadors will be at the forefront of congregational and non-traditional ministry settings, serving families that suffer under the effects of addiction, depression and other related illnesses in all various and destructive forms. (NOTE: These sessions are not meant to serve as rehab or therapy for addicts or for those who are suffering with depression. These sessions are for church leaders and family members who want to learn about these diseases and learn about ways to offer support, resources and encouragement to loved ones who suffer.) 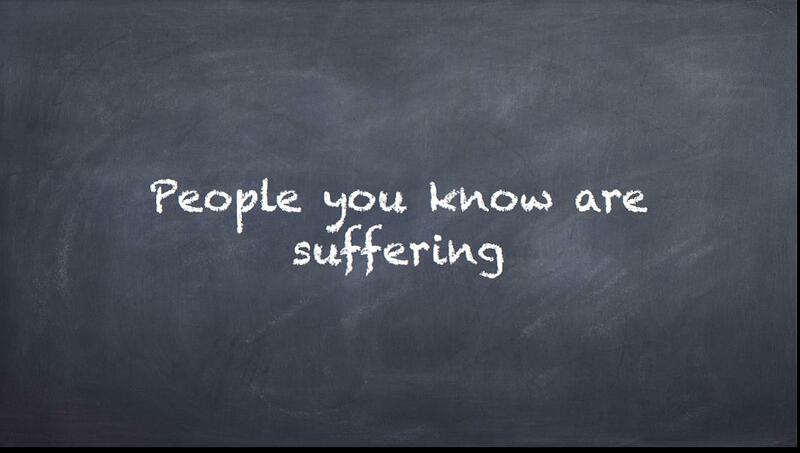 Proposed Spotlight topics include: Addiction, Depression and Grief Support. At least, that’s the idea. That is my hope. That is the dream that has developed over the course of 10+ years. At worst, those in attendance will garner tools to effectively activate hope in their own lives and in the lives of those in their spheres of influence. At best, Hope Ambassadors will begin to appear in congregations all over the world among people of faith in Jesus, offering the same hope and healing that Jesus offered during his earthly ministry, doing even greater things, even as He promised we would. I know about the chaos and the stress that surrounds loved ones suffering with addiction or mental illnesses – those that have been diagnosed as well as those that have not. I know what it’s like to lose someone you love dearly and I know what it’s like to see God transform and heal someone you love dearly. I know what it’s like to be transformed from the inside-out! I, too, have hoped that my experience would bring good on a larger scale through the process of transformation. In that context and from that perspective, I lift up the banner of hope. 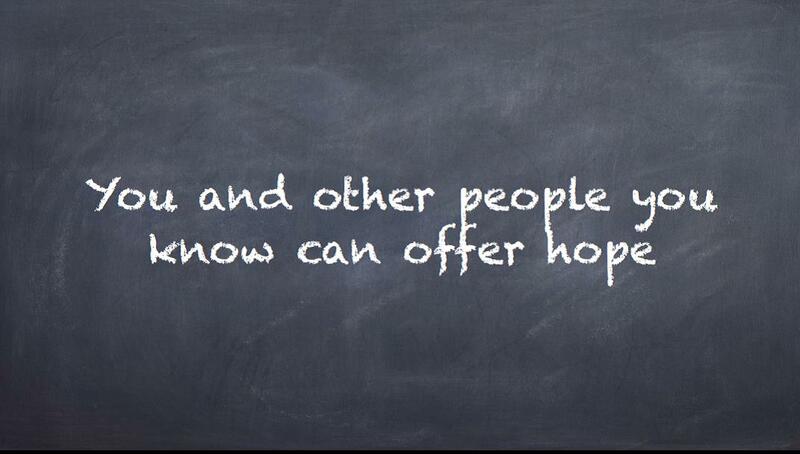 If any group of people on earth should understand hope, it should be my fellow followers of Jesus. However, my experience shows that church members are generally ill-equipped to offer hope to hurting, desperate people. A lack of education, partnered with bad advice and a code of silence regarding stigmatized behaviors in the church has left many of its members in situations of prolonged suffering and marginalization. Too many people and too many families are suffering for the church to continue on this path. This need is much broader than any denomination. In Jesus, we find all the hope any of us could ever need. The church must be a place where hope is experienced and taught and nurtured. And the church is not the building where we gather on Sundays to worship. The church is the people who do the gathering and the serving and the worshiping and the praying … and the hoping. Wherever those people go. Romans 8:24 For in (or by) hope we were saved. Now hope that is seen is not hope. For who hopes (or awaits) for what is seen? **If you are interested in the Hope Ambassador ministry project or would like to participate as a pilot group member, please leave a comment here with an email address whereby you can be contacted.